To tout the rejiggered App Store's new features, Apple on Wednesday released a series of short commercials urging iOS device users — and soon-to-be converts — to check out all the service has to offer. A first ad, aptly titled "Welcome to the #newAppStore," provides a brief overview of the app's new features. Starting with the main page, users will see App Store editor selections arranged by day. In the example offered, curated choices for "Today" include a single app — VSCO — an "Our Favorites" collection for going out and another group of health apps. As seen elsewhere in the App Store, each featured item gets its own card, streamlining browsing and app discovery. App cards incorporate informational text and in-app images that previously populated dedicated pages as separate entities. The UI change makes for a cleaner, more cohesive experience, especially when browsing through curated content. Further, users can share app cards to spread the word on undiscovered titles or hidden gems. Apple also posted three shorter 15-second spots focusing on app collections and standout hit Monument Valley 2. The first app grouping comes from the "Now Trending" card, which features a selection of popular titles that are gaining notoriety from users. For its ad, Apple threw a spotlight on "The Quest for [fire emoji] Kicks," a collection of five shoe buying apps designed to help users get their hands on hard to find or hot footwear. A second ad focuses on "App Culture" collections, which appear to be editor selections relating to art and culture. The first set of curated apps, as shown off in Apple's commercial, focus on karaoke. Finally, a fourth spot highlights Monument Valley 2, offering viewers a sampling of the game's signature artwork and gameplay. Each new commercial is accomplished using 2D cutout-style illustrations similar to Google's "Material Design" aesthetic. 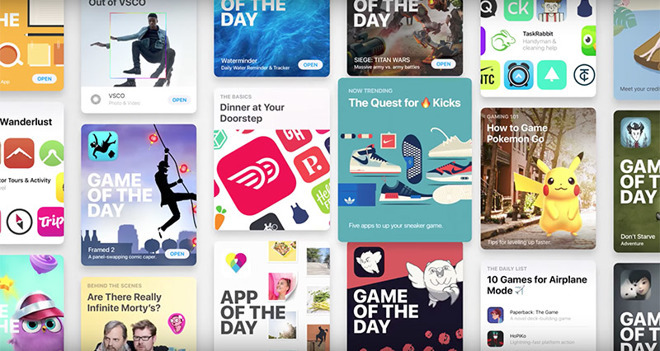 The simplified visual style makes for a clean look on the new App Store, which can tend to get cluttered with individual app cards sporting rich 3D graphics. Users can access the revamped App Store by installing iOS 11, which launched yesterday for iPhone 5s and newer, iPad mini 2 and up, the iPad Air and newer, all iPad Pros, as well as the 6th generation iPod touch. Along with a refreshed UI, Apple's latest mobile operating system boasts support for augmented reality apps through ARKit, reworked Siri virtual assistant technology, a new Music app and much more. For more information on iOS 11, check out AppleInsider's Inside iOS 11 series.